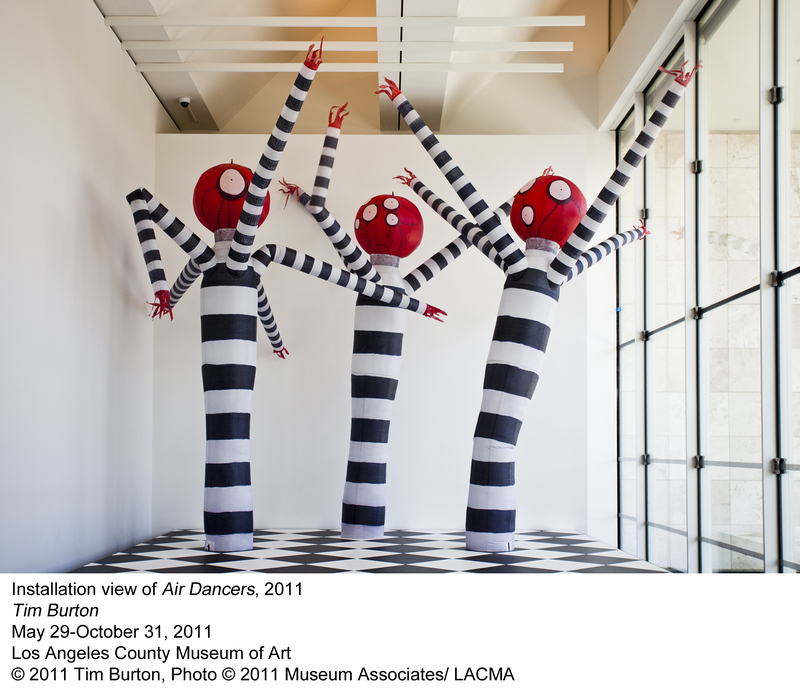 Home Exhibition Reviews Is the Tim Burton Exhibition at LACMA for Kids? Tim Burton at LACMA is a blockbuster hit. Over 134,000 people saw the show in the first eight weeks of its Los Angeles run. And because of the youth appeal of Burton’s work, many of these visitors were young adults and children. 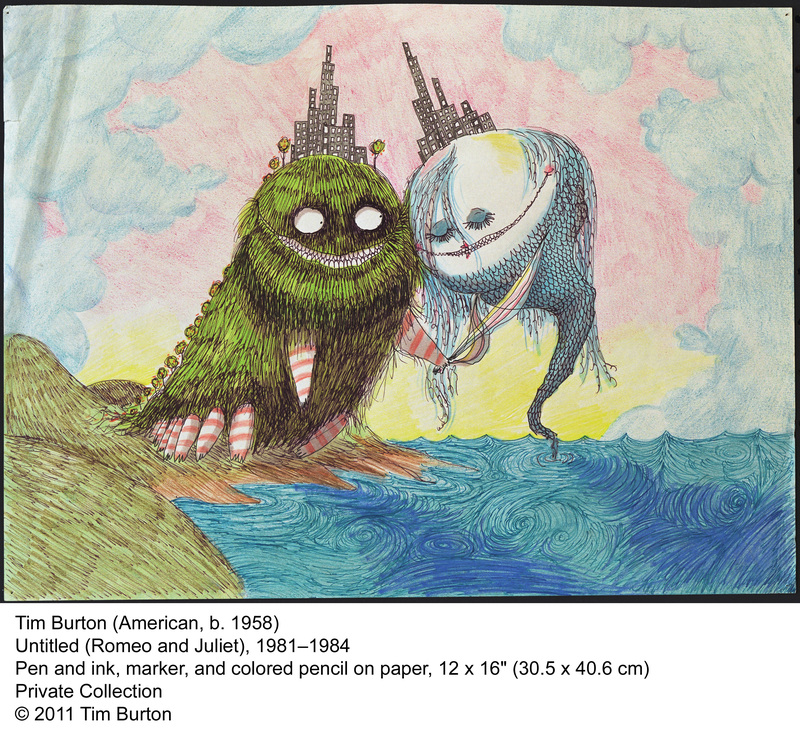 The exhibition is a major retrospective of Burton’s career as a film director, artist, and writer. It has 700 objects on display including drawings, paintings, and lots of movie memorabilia (props, costumes, animation puppets). I heard mixed reviews from parents who took their kids to see Tim Burton at LACMA. Two moms had completely different opinions even though they both have young elementary school age girls. The first mom loved the show. She said that seeing Burton’s work transformed the way her daughter drew – she said overnight her daughter went from drawing rudimentary stick figures to drawing fanciful spirals. The second mom said her daughter Sofia said it was scary.” With the closing date quickly approaching on October 31st, I took my sons (ages 7 & 9 yrs) to see what they thought of the exhibition. We went to LACMA early Friday afternoon. We reached the Resnick Pavilion and the fun house-like entrance to the Tim Burton exhibition beckoned. We entered through the mouth of a larger than life Burtonesque character and found ourselves in a small room that provides a brief introduction and timeline of Burton’s artistic career. My 7 yr old son checked out a metal “RobotBoy” sculpture with flashing electronic eyes (his favorite thing in the show), and we moved on to the first section “Surviving Burbank.” Even though Burton was born in Burbank, he felt like an outsider growing up in what was then a small town. Burton used creative expression to deal with his boyhood feelings of alienation from Burbank’s suburban culture of conformity. There are plenty of early drawings on view, but my kids immediately gravitated toward a video monitor showing Burton’s adolescent film projects, including a silent B&W film he made about the magician Harry Houdini. The boys really enjoyed watching Houdini and several other amateur Burton short films. It was also interesting to see what inspired, and later influenced, Burton’s artistic development like the memorabilia of Vincent Price horror films and classic monster B-movies. His lifelong affinity with outsider characters was already apparent. The second section, “Beautifying Burbank” displays Burton’s work from his days as a Walt Disney animator and as a Cal Arts student. We looked at some of the drawings and paintings on display, but my kids became transfixed again by Burton’s films and animated videos in this room. Benches are set-up in one area to view Burton’s Disney version of “Hansel and Gretel” – a rare opportunity to see this quirky fairy tale that aired only once on T.V. If we had the time, they would have liked to watch the entire movie. A black-light room featuring a large glowing hanging carousel installation marks the transition toward the last section “Beyond Burbank.” And it is at this point that the exhibition turns dark; literally and figuratively. The next room is dimly lit with dark grey walls. It’s filled with spooky images of Burton’s most popular offbeat movie characters like Jack from the Nightmare before Christmas and Edward Scissorhands. For Burton fans, I’m sure this is where the show really takes off, but for families with young children, this is where the show might get a little scary. In the darkness, the long sharp steely blades of Edward’s hands gleamed. And a case containing Burton’s “Blue Baby with Nails,” a plastic doll covered in nail punctures and bloodstains, loomed in the distance. I could see why my friend’s daughter Sofia found the show disturbing. The last room is not nearly as dark but still has some scary objects for young children. This section has plenty of striking movie memorabilia; including props and intricately designed puppets Burton used in his stop motion animation films. My 9 yr old said watching this section’s Stain Boy animated videos was his favorite part of the show. 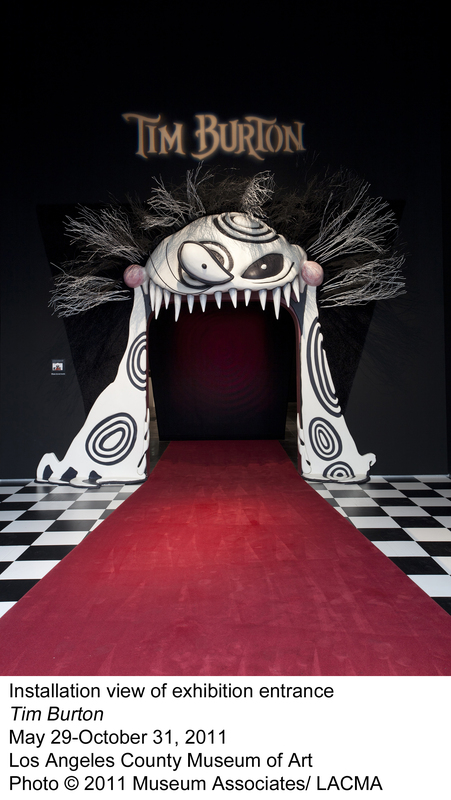 So now, do I think parents should take their kids to see Tim Burton at LACMA? I say it depends on the age and interest of your child. For younger elementary school age children, I would be cautious due to the scary content in the later part of the show. An option for this age group is to visit only the first part of the exhibition, and then check out LACMA’s Boone Children’s Gallery – a great place for families to make art together. For high school and middle school age children interested in Burton’s work and/or his art forms, I think the exhibition has a lot to inspire young audiences. It can also provide an opportunity for parents to talk to their children about what it means to either fit in or feel like an outsider – a particularly relevant issue for this age group. But I think Burton himself articulates the show’s most powerful theme for families to explore. Burton said that creating the exhibition “made me realize what you do early in life really kind of shapes your life.” Now that’s something I wish I’d thought more about when I was young. Multimedia Tour: Available at the exhibition ($7 /$6 members). This iPod touch exhibition tour includes a Tim Burton interview video and interesting, but brief, background information. 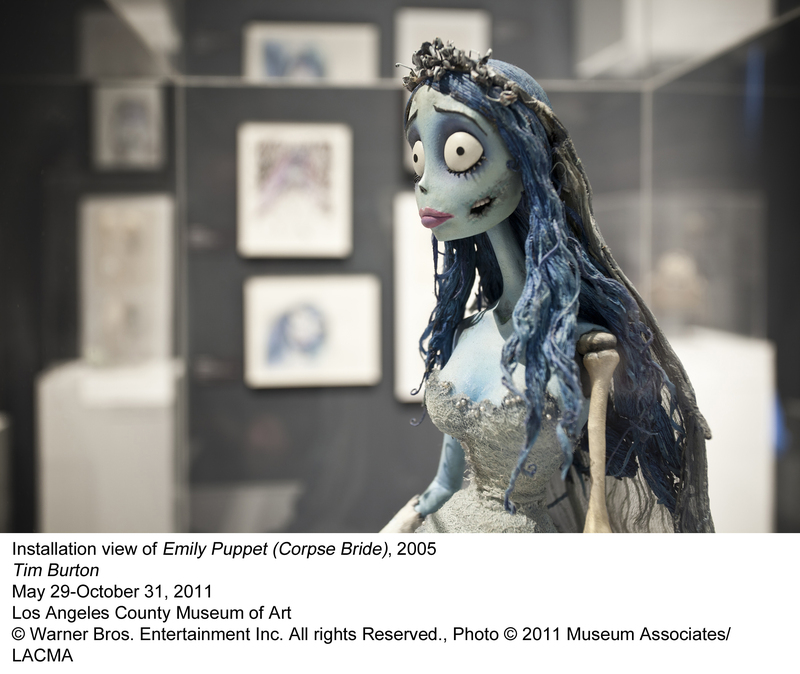 Special Events: Be sure to check out Tim Burton closing weekend special events at LACMA including lots of fun kids activities. More to Read: The exhibition has very few explanatory wall labels. The multimedia tour provides some context but its worth doing a little background reading if you have time. 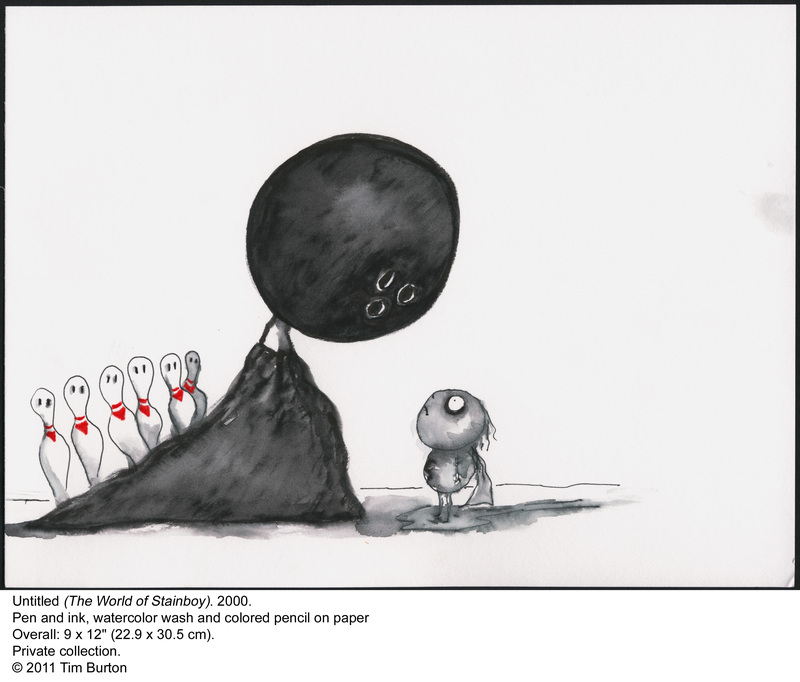 Check out the L.A. Times Tim Burton exhibition review, and LACMA’s website and LACMA’s blog UNFRAMED for more on Tim Burton and his work. 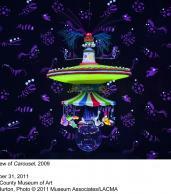 Remember Tim Burton closes October 31st, 2011. So if you want to bring the family, go soon to avoid the crowds.